Brushing teeth is a necessary hygiene habit kids should learn from an early age. However, many kids out there still do not know the proper way to brush their teeth, or simply find it a chore. Because of this, more than 16 million kids suffer from untreated tooth decay in the U.S.! If you too shudder at the revelation, then you’ll appreciate our app pick for today: Toothsavers. Created by The Ad Council and the Partnership for Healthy Mouths, Healthy Lives, it is a fun app which encourages kids to brush their teeth daily. Starting the app for the first time, kids will be greeted by a short narration of an unfortunate kingdom cursed by an evil sorceress. The wicked spell left the kingdom’s quirky inhabitants with rotten mouths and decaying teeth, and it is now up to your kids to help Toothy and the Toothsavers return everyone’s precious smiles. Using their fingers, kids brush each character’s teeth to get rid of all the nasty grub stuck there. Occasionally, kids also have to tap to banish the bacteria that show up in the character’s mouth. While they play, a young boy’s voice provides them with helpful instructions and tips for proper toothbrushing, such as brushing behind the teeth and brushing away from the gums. At the end of the two-minute game, up to three stars may be awarded for brushing the character well. The app also includes animated videos to accompany the kids as they brush their teeth for real. The easy-to-follow videos last two minutes (the recommended duration for brushing one’s teeth), and shows how to properly brush one’s teeth. They also feature helpful tips and moral support from the same narrator. Completing the video twice a day will unlock a new character to play with. The app provides 10 wacky characters, many of which will already be familiar to most kids: pirate, dragon, Little Red Riding Hood, and even the evil sorceress herself. Each character comes with its own toothbrushing game and companion video. An additional and fun feature is the two-player Toothsaver mode. One player holds the device over his mouth, and animates a cartoon mouth by speaking into the microphone. The other player must then attempt to brush the teeth until they are clean. Toothsavers is part of the Kids’ Healthy Mouths campaign, which aims to motivate parents to take action to reduce their children’s risk of oral disease by making sure their kids are brushing their teeth for two minutes, twice a day. The app was created by the Ad Council, a nonprofit organization behind famous public service campaigns like Smokey Bear and McGruff the Crime Dog. Besides fun games, the app also provides helpful tools for parents. The protected parents’ section includes the option to set daily brushing times and reminders, plus a calendar for monitoring kids’ brushing progress. The game also has an interactive map to chart each day and night that kids brush with Toothsavers. 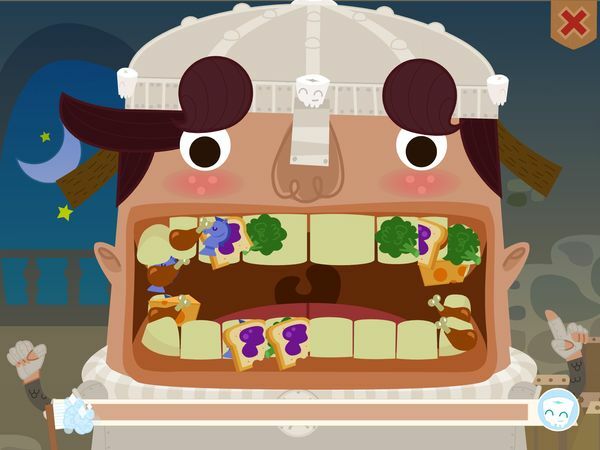 Toothsavers is available for free as a Flash game on the web, an iOS app, and an Android app. The game does not have ads or in-app purchases. Toothsavers is a terrific app with a great purpose. I don’t find apps about personal hygiene very often, so the app is special for me. It also happens to be of high quality, seamlessly blending education and game in one fun package. The idea to unlock new characters by brushing your teeth is clever, and a great motivation to keep kids coming back. The gameplay may be the same, but kids will get new characters and animations when they come back. I especially like how characters also have different, albeit equally weird, things stuck in their teeth, e.g. chess pieces, picnic blankets, sandwiches, etc. The fact that the app is easy to navigate and fully narrated is also a huge plus. Using a young boy’s voice to narrate the app is a great decision as the app feels more relatable that way. I also like that the narrator keeps providing useful tips during the game. Toothsavers is a terrific little app that effectively teaches kids how to brush their teeth and encourages them to do it daily. The gameplay may be simple and repetitive, but it is effective for drilling a good habit into kids ages 3–6. Parental tools are also available for monitoring the child’s brushing progress and setting up reminders. Overall, it’s a great app that I highly recommend.